So it's about time for a celebration. 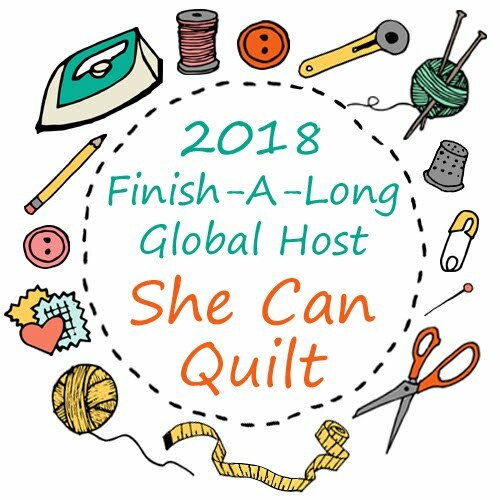 To thank you for being here, as part of my quilting community, I have arranged for some giveaways from my sponsors and I will have a giveaway from me in the week of my actual blog birthday too. Today, Green Fairy Quilts is sponsoring a wonderful giveaway of this bundle of 40 fat eights of Strawberry Fields Revisited by Fig Tree & Co.
Green Fairy Quilts has been a sponsor of mine for a long time now and I have to say that they are fantastic to work with. I love shopping at their store because I know that they will beat anyone's price (including shipping costs) on any of the products that they sell. Green Fairy Quilts sells a huge selection of pre-cuts from Moda, Quilting Treasures, Riley Blake and Robert Kaufman. They also sell notions, books and patterns, batting, some yardage, and my particular favourite - a lot of different threads - spools and sets - from Aurifil, Superior Threads, Coats & Clark, Lana Wools, and Filtec bobbins. In the USA they free shipping for orders over $10 and for large orders outside the USA - over $250 Canada, $350 International - there is free shipping too. They have a special deal daily and special sales weekly. Clint and Judi Madsen run their family business in a such a friendly manner, it is always a pleasure to shop with them, and so I do often. And, Green Fairy Quilts gives too, they have supported charity work in Romania for years. Sign up for the Green Fairy Quilts Newsletter, go here, and then come back and leave a second comment letting me know that you did - or that you already receive it. Follow the instructions on my instagram post about this giveaway. Help me lovely people - if you don't have your email attached to your commenting profile, please leave it in your comment (emailhandle [at] provider.comorwhatever - is a way to make it more secure if you like.) The giveaway has been open for an hour and a half and there are already 14 people who are "no reply". That means that if their number is drawn I will draw again as I will not be able to contact them. The giveaway will close at Midnight on Friday, February 19 and I will use the random number generator to draw the winner from the comments on this post and on my instagram post and announce the winner on Saturday (from QuiltCon). Happy blog birthday! I enjoy reading it very much. You are very inspiring! Congrats on having such a successful blog. not really clear - is this a giveaway here or on instagram. I have a mug full of those green fairy pens, a testament to the shopping sprees I went on (smile). Followed you on Instagram for a while - don't know how I missed your blog. Thanks for posting the giveaway with the blog reminder. Feels like I won by getting fun reading and inspiration! Happy bloggy birthday and congratulations on the internet milestones! You can add another 677 Feedly followers to your stats, it just goes to show how many more people use Bloglovin' than Feedly! (I hadn't realised there was such a difference!) Here's to the next five years!!! Congratulations on the success of your blog; I sure enjoy it. Aren't the soft colors of Strawberry Fields Revisited lovely? Yes, I follow your blog on Feedly. Great way to celebrate a milestone! I've enjoyed your blog for years and now mostly click over from Instagram. I'm a fan of Green Fairy too. Expecting a package from them tomorrow. I love to follow you via bloglovin and I'd love to win a fateight-bundle! Great! Five years is wonderful! Congratulations to you! I always look forward to your posts and especially to seeing your work. I don't know the textile equivalent for having a strong clear voice, but your quilts have it, and it's wonderful. Thanks for your giveaway. I have shopped at Green Fairy before, always with great satisfaction. Congratulations on your milestones! That is a lot of followers. Thank you for the rest giveaway. I already get Green Fairy's newsletter. They do have a great selection of fabrics and I love watching Judi quilt on her long arm. Wonderful giveaway! Love this collection. I already get Green Fairy's newsletter-great shop, waiting for a recent order to arrive! I follow you on Bloglovin. Thanks for the giveaway. I follow your blog and on Instagram. I follow you on Instagram. Congratulations on these milestones! I receive Greeny Fairy newsletters already. Congratulations on your 5 year bloganniversary! I follow your blog on Bloglovn. Congratulations on this milestone blog birthday! Wow, five years and all those followers -- you've inspired a lot of people! Including me. Congratulations! Happy blog birthday. I really enjoy watching what you do. Inspires me to improve! I follow you by email newsletter. I already subscribe to Green Fairy's newsletter. Love their service and prices! Congratulations on your blog anniversary! I love it! I follo your blog via email. Wow, congrats on five years of blogging! Thanks to you and Green Fairy for the fun giveaway. I follow Green Fairy's newsletter via email. CONGRATS Leanne! I've enjoyed following you for quite some time now and you have inspired me many times over to begin a project that I wasn't sure about. 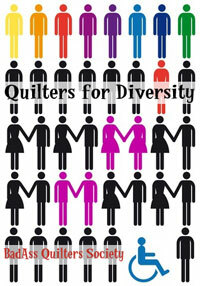 You have much to add to this quilting community and I'm glad that I found you. I check out your blog weekly and I follow you thru email. I did go over to Green fairy and signed up for the newsletter. It looks like those folks are very charitable and involved in important crusades. Sometimes I check in even when an email doesn't appear! Don't want to miss anything that you are up to. I received Green Fairy newsletter and have for a long time. I would love to win (but who wouldn't?). Thanks. How exciting - 5 years(almost)! Happy early blog birthday. RECEIVING GREEN FAIRY'S NEWSLETTER>LOVE THEIR SHOP! I love that fabric. Thanks! Fantastic giveaway! I love Strawberry Fields Revisited. I already receive Green Fairy Quilt's newsletter. THANKS TO YOU+GFQ'S FOR SUCH A SWEET GIVEAWAY! BEAUTIFUL BUNDLE TO MAKE A REALLY PRETTY QUILT! I just started following your blog and love it! I have subscribed ( and ordered form) Green Fairy for a long time . They are great! I look forward to a great year of inspiration! Thank you and congratulations! 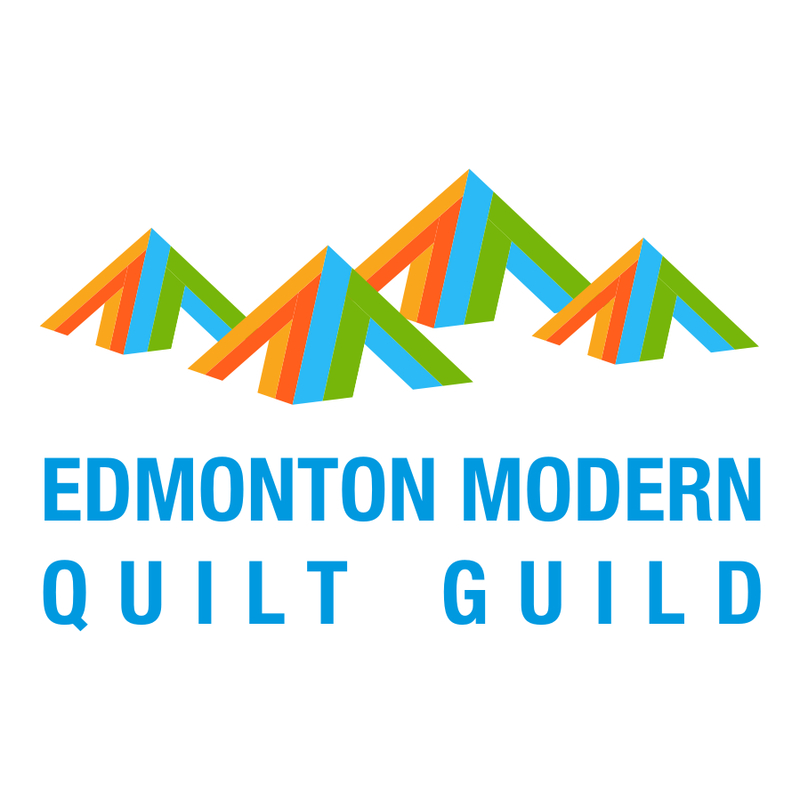 I've signed up for Green Fairy Quilts' newsletter! Congrats on your blogiversary & so many followers! 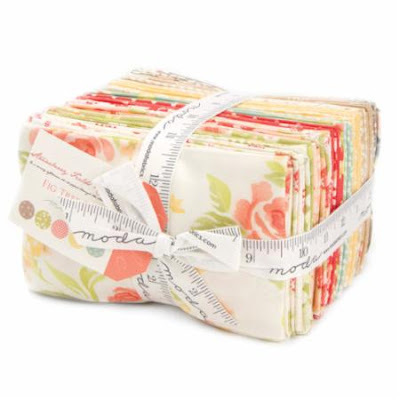 I love the Moda fabric. Congratulations on your 5-year! I enjoy, and I'm inspired by your blog. Green Fairy Quilts is the best! I'm a subscriber to Green Fairy Quilts. I'm a subscriber to SCQ blog. Thank you for sharing your five year blog birthday with us by offering this give-a-way. Congratulations! The day I discovered your blog was a happy day! I may have done a happy dance after I saw some of your quilts. I am a subscriber to GFQ newsletter. Their shop is one of my favorites. 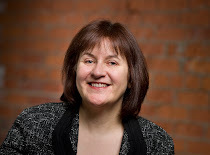 Happy 5th Blog Birthday, Leanne! My thanks to you & Green Fairy Quilts for the yummy prize & the opportunity to become its new owner! I follow you via email and Bloglovin. I don't want to miss a post! I'm already a happy customer of Green Fairy Quilts and do subscribe to their emails! Thanks for the giveaway opportunity. 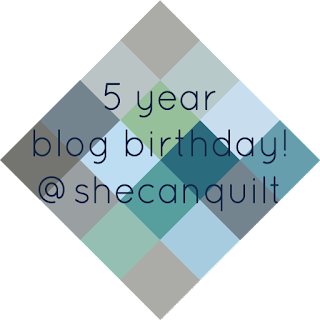 Congratulations on your fifth year blogaversary! Congratulations on your blog anniversary. Love Strawberry Fields Revisited. I do subscribe to your blog via email. I've enjoyed & appreciated so many of your tutorials. Thank you and congratulations on your phenomenal blogging success! Happy Birthday! I also like Green Fairy Quilts - I've shopped there a couple of times! I follow your blog via e-mail and Facebook. I am already receiving the Green Fairy Emails. Congratulations! Those are some impressive milestones, especially in a short period of time. Just imagine another five years! I follow on Bloglovin' Enjoy it! I have been receiving Green Fairy emails/newsletter for quite a while now. I already receive Green Fairy newsletter. I LOVE Fig Tree, hope to be a winner. I follow Green Fairy newsletter via email! I follow I Can Quilt here and on Bloglovin. I follow your blog and have enjoyed the email dialogue we have occasionally had. It is a learning place, for sure. I follow you on instagram, I @greenfairyquilts on instagram. I am commenting because you asked so nicely. Good Luck to everyone that has entered the giveaway and Thanks for sponsoring fabric people! Happy Blog Birthday! Way to go! I follow the Green Fairy Quilts newsletter. Congrats on 5 years! Wow! Love Fig Tree & Co..
Congrats on such a wonderful milestone!! I follow you on Bloglovin. Congratulations! I do receive the GF newsletter. I have been following you through Google. I signed up for the Green Fairy newsletter. Thank you. Great fabric collection! Thank you. I receive the Green Fairy newsletter via email. Congrats on all of those followers! WooHoo! I'm one of them! I follow by email! And I follow Green Fairy Quilts! Happy Social Media Milestones!! WOWEEE You have a lot of followers!! I am a longtime blog follower and for some reason never thought to look for you on IG. So you now have a new IG follower!! Congrats on your 5 years blogging anniversary! I get Green Fairy newsletter by email, in fact I placed an order this morning! Enjoy your blog so much and follow it by email. I have been following your blog for a lot of years. You are such an inspiration. I am now an IG follower. You are so sweet to have this give away!! I I get Green Fairy Quilts and have spend a boatload of my money there. They have such great service, and I have a zillion of their green pens. Congratulations on blogging 5 years. Green Fairy quilts is a great sponsor. They are one of my favorite online shops. I already receive the Green Fairy Quilts newsletter. Congratulations. I follow you by email. Best wishes for your future success! I always enjoy reading your blog. Happy 5th birthday! Thanks for all your inspiration! Happy Anniversary and thanks for the give away! I get the Green Fairy newsletter. They are my first stop on the internet if I need to get fabric that I can't find locally. Wow!! You have a lot to celebrate!! Congratulations - it is all awesome!! I am getting the Green Fairy newsletter!! Thanks!! I follow you via Bloglovin and IG!! Thanks for the giveaway! I'm a follower for a long time now. I've been receiving their newsletter for awhile now! Fig Tree has such a sophisticated pallet. Love their sensibility. What a great giveaway from Green Fairy. Love them too. Congratulation on 6 years. I follow your blog by email. It's great to see you header in my inbox. Congratulations on your achievement! Way to go! I also follow the Green fairy!